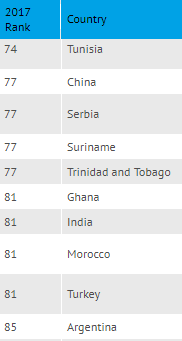 Among the comparable BRICS countries, while Brazil (96th) and Russia (135th) than India (81st), China (77th) and South Africa (71st) perform better. The biggest consolation for India is, India’s neighbours rank worse: Pakistan 117th, Bangladesh, 143rd, Sri Lanka 91st, and Nepal 112nd. Worked out by Transparency International, a Berlin-based international NGO, CPI aggregates data from a number of different sources that provide perceptions by business people and country experts of the level of corruption in the public sector. The data sources are taken from 12 different institutions, which include the Economist Intelligence Unit, the World Bank and the World Economic Forum. It seeks to analyze bribery, diversion of public funds, use of public office for private gain, nepotism in the civil service, the government’s ability to enforce integrity mechanisms, the effective prosecution of corrupt officials, red tape and excessive bureaucratic burden, existence of adequate laws on financial disclosure, and so on. This year, New Zealand and Denmark rank highest, while Syria, South Sudan and Somalia rank lowest. The best performing region is Western Europe, while the worst performing regions are Sub-Saharan Africa and Eastern Europe and Central Asia. The index, which ranks 180 countries and territories by their perceived levels of public sector corruption according to experts and businesspeople, uses a scale of 0 to 100, where 0 is highly corrupt and 100 is very clean. 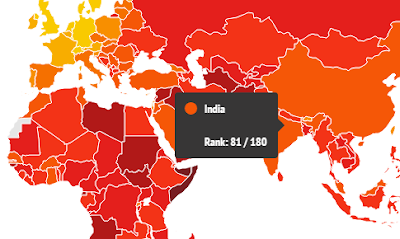 On a scale of 100, India’s score is 40, worse than the global average of 43.